The Nazca Lines are a series of ancient geoglyphs located in the Nazca Desert in southern Peru. They were designated as a UNESCO World Heritage Site in 1994. The designs are shallow lines made in the ground by removing the reddish pebbles and uncovering the whitish/grayish ground beneath. Due to its isolation and to the dry, windless, and stable climate of the plateau, the lines have mostly been naturally preserved. The Hummingbirds are New World birds that constitute the family Trochilidae. They are among the smallest of birds. They are known as hummingbirds because of the humming sound created by their beating wings which flap at high frequencies audible to humans. 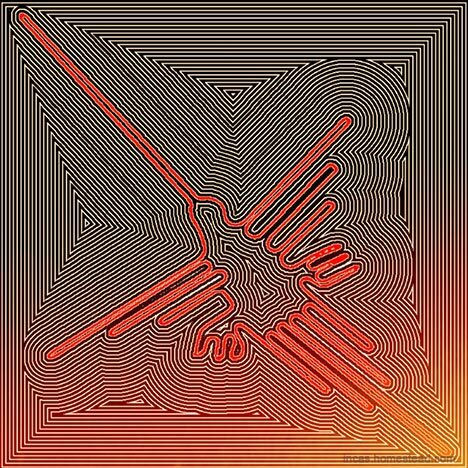 Isolines Art Illustration: Nazca Lines: the Parrot.